Installing new flooring is a costly enterprise, so you want to get it right the first time around. If you've chosen to go the vinyl path, you're probably wondering about the best underlayment for vinyl plank flooring. Actually, you may not even need underlayment depending on the product and where you plan to install it. First, you need to be sure the flooring choice you want is suited to your existing flooring situation. Is your subfloor in great shape? Is it smooth and free of flaws, squeakless and level? Sometimes, underlayment can help compensate for a subfloor that isn't perfectly smooth. Then again, some vinyl planks are also designed with a built-in underlay or are made to be installed without any. What kind of subfloor is it? If it's concrete subfloor, underlayment is probably a good move depending on the product. It'll give you a moisture barrier as well as providing a little cushion to make walking more comfortable. It's also a good move for thermal reasons, as it will help to keep your space warmer in the winter. For wood subfloor, a moisture barrier is unnecessary, but underlayment can provide cushion. 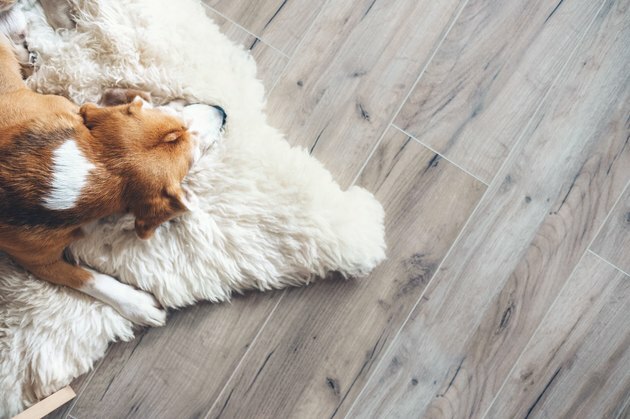 When installing vinyl plank flooring over existing floor materials, underlayment may not be required, but it can help with cushioning and sound reduction. People turn to underlayment for comfort underfoot, sound reduction and moisture barriers. Comfort may seem like a strange thing to worry about with flooring, but walking on concrete and hard surfaces can be tough on the body. For some people, a good underlayment can make a big difference in how it feels to be on their feet all day. Sound reduction is also a big consideration with underlayment. It's not just about dampening the sound of footfalls but all sound. If you're putting flooring in your children's rooms, for instance, or you have downstairs neighbors, sound-dampening underlayment can help muffle any noise happening in that space. It means less sound carrying from room to room and between floors, and it can be required in some condos and homeowners' associations. Not all underlayment offers moisture barriers, and not all flooring situations require it, but they are useful in numerous situations. When laying floors over concrete, it's necessary because groundwater can rise up through concrete and damage the floor or cause mold. Other situations benefit from a moisture barrier too, like when flooring a room adjacent to a swimming pool or a bathroom or kitchen where moisture is common. For spills and frequent dampness, having that layer of moisture barrier means protecting your subfloors for the long haul while also slowing down any potential flooding damage. This product is one of the fastest-growing products in flooring. Luxury vinyl plank is engineered to look fantastic while being both affordable and an easy product to install. If you're wondering about luxury vinyl plank underlayment, that's one of the appeals – it usually doesn't need underlayment. In fact, as a softer flooring, adding an underlayment could mean too much cushion, resulting in dents and more wear and tear sooner. Opt for a dense underlayment if you go for one. A selling point of luxury vinyl plank is that it is designed to be a thin installation, so it can easily go in over existing floors without raising your floor height. Because of its thinness, it's critical that existing floors be level and smooth since any raised portions will cause uneven wear on the vinyl surface, ruining the effect. This means that installing it over tile is not recommended. Luxury vinyl plank generally doesn't get affixed to the subfloor in any way. Since it's a floating floor system, it's also not recommended to install it over other floating floor products. When choosing products you like, the best thing to do is to ask about it and refer to manufacturer recommendations too. The manufacturer's recommendations should outweigh a salesperson's recommendations. Ultimately, flooring works hard for you, and if it ticks all the boxes on function and you like the style, then ask if it needs underlayment. The manufacturer will often specify what is recommended and why. Vinyl planks and vinyl tiles are not wood, and they're not laminate – they're vinyl. That sounds obvious, but what it means is that you can't use products best suited for wood or laminate and expect the same results with vinyl. In fact, you generally can't use underlay products designed for wood, laminate or tile. Even among varying vinyl products, you'll find different requirements. One may recommend underlayment, and another may actually void its warranty if underlay is used. It's really critical that you look at the product you like and follow what it requires. When a product recommends using underlayment, not using it can be a major issue. It can mean the flooring doesn't last as long or doesn't perform well. Some consumers report skipping recommended underlayment and regretting it because of what they call a "clapping" sound. This clapping can happen when there's even just a 1-millimeter variation in height along the length of a plank. Underlayment can also ensure you're not driven mad as the dog's nails clack along the floor with every step. If installing over concrete in a basement, the vinyl planking is likely to be fine if there's a moisture issue, but a moisture barrier will also help control air humidity in the space. In some climates, that's a huge factor in making a basement more livable. One thing is certain with underlayment and vinyl plank flooring, though, and that's the fact that when it's recommended, it must be thin and it must be dense. While underlayment for vinyl planks may be used under hardwood and laminate, the reverse is not true. Vinyl planks require hard, thin underlay because the product itself is softer. Putting a soft product under vinyl plank will result in an unstable floor that is much more inclined to being damaged and even punctured or torn over time. Vinyl flooring installation with tiles and planks can be simple even if using underlayment. However, when you can take the underlay out of the equation, it's an even easier job. You can save between $1 to $4 a square foot by installing it yourself. Taking that into consideration, purchasing a higher-grade product that has a built-in underlayment may ultimately be a more cost-effective choice. If you decide to go with a glue-down vinyl plank flooring, you may have a more difficult product to remove in the distant future, but you also won't have to worry about underlayment costs. When a product has the built-in underlayment layer, the odds are very good that you'll negate the warranty if you ignore manufacturer advice and install an underlay. If an underlayment seems necessary for you, your time may be better spent in doing a more thorough job in ensuring the surface is smooth, clean and dust free before doing your vinyl plank installation. In that vein, sometimes paying for professional installation can be worth the investment if it reduces the uneven clapping and extends the life of the product.